It is available now on Amazon and Smashwords. "A tiny bit Twilight, A tiny bit Men in Black, and a whole lot of fun!" For a limited time the first book in the series, How to Date an Alien is only 99 cents for the Ebook. 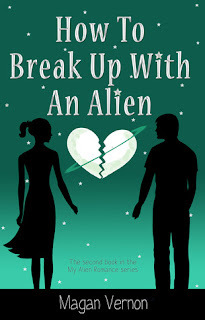 The #1 Alien Romance on Goodreads! Get it to day at Amazon, Barnes & Noble, & Smashwords. Stay tuned for more details and a giveaway coming up with The Indelibles! Magan is a self-proclaimed geek-to-glam poster child who channels her inner geek by writing science fiction for teens, even though she slept with a night light until she was in middle school for fear of alien attacks. She now lives with her husband, daughter, and dog in central Illinois where she still sleeps with a night light...just in case. You can find her on her web site. Congrats to Magan! And yay for you, always showcasing others. I may have to pick this one up. Just the titles in this series make me grin. This looks great. Congrats to Magan. Thanks for sharing this, Heather. They are cute titles aren't that? That alone makes one want to pick them up.